1. There’s one picture I didn’t show you yesterday. The first one I took upon arriving in Colorado Springs. 2. So, I’d love to know – are you following LoafNJug on Twitter? If not, who are you following? 3. Dayton’s Light the Night walk is on Thursday and sweet Ally and her family will be walking along with their 350+ team members. Their goal to raise $10,000 for the Leukemia and Lymphoma Society has been far surpassed and they’re quickly approaching the $30,000 mark. I stand in awe of their efforts and will spend all week praying that Ally will feel well enough to walk alongside her team. 4. While in Colorado I noticed my friend Catie sporting some mighty cute shoes and I even tried to walk off with them. It didn’t work. But I was elated to hear they came from Target and now they’ve found a happy home on my feet as well. Mine are blue because, well, Catie’s are blue and I think Catie’s cool. So blue it had to be! 6. I’m taking Sarah on a little photoshoot this week hoping to get the shot for her birthday party invitations. I have a fun idea in my head that I’ll be sure to share if it all works out! 7. We made zucchini muffins this morning out of a HUGE zuke that came out of our veggie box last week. They were delish…especially after we added the cream cheese icing! 8. The muffins reminded me that it’s time to break out Susie’s Pumpkin Chocolate Chip Bars that have become a fall staple in our house. I sent Brent out in search of canned pumpkin a couple of weeks ago for this exact purpose and he came home empty handed announcing that the store manager told him “you won’t find a can of pumpkin anywhere in this town, guarantee it.” Apparently there’s a shortage this year around the country. (*shudder*…I need my pumpkin chocolate chip bars!) I took it as a personal challenge though and secured the last four extra large cans of pumpkin on the shelves of our commissary. I figure those four cans will be good for at least eight batches of pumpkin bars. That may get us through. 10. I have one little overnight jaunt planned for October (to photograph my friend Liz’s newest addition in VA!) and then I think I’m done with my travels for 2009. My neighbors don’t believe me. I think they’ll put a for sale sign in the yard the next time we load up our car so I’m pretty sure we need to stick around here, at least for a few months. Re: #4, I just have to tell you I have the exact same shoes. In blue. And I do love them so. So glad you had a great trip! What fun photos 🙂 And I’m with you on keeping the kids in the 5-pt harness as long as possible. I’ve read one too many sad stories while doing car seat research!! I have G in the Graco Nautilus which should last looong time. I’ll have to move C into one eventually too to be able to keep the 5-pts! Glad you posted this! Are you saying you don’t want to puree pumpkin either? Just wanted to add my two cents–my son is 4 and we moved him to a Graco Nautilus recently. He loves it and is able to almost do it all by himself. Not that I like to advocate Wal-Mart, but they had the cheapest price at $155. It’s a great seat and you will not have to buy another one! I love when Ten on Tuesday gets comments from people who all find a different piece to comment on. Isn’t that beauty of a ToT? It’s for bread but I just used muffin tins and then decreased the bake time by about half. I know people in seattle! I can think of two very great, eligible girls right off the top of my head. Send me details of the guy…how old? where does he live? I know lots of people there! It would be fun to connect them!! Glad you enjoyed your CO trip. We love being back here. 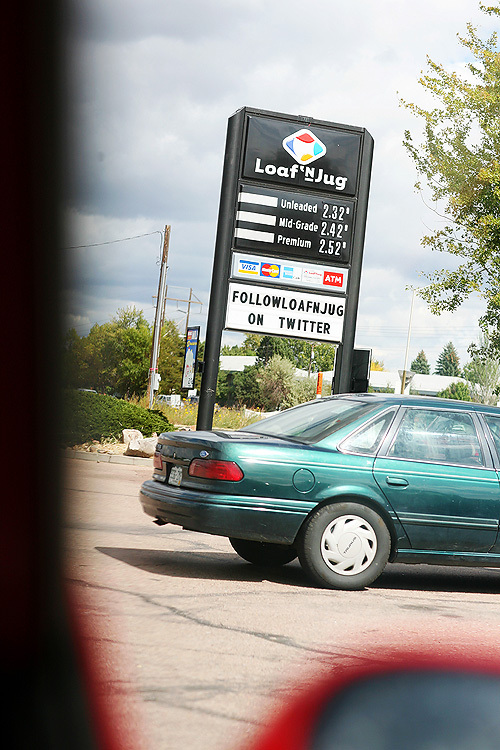 Okay the first thing that came to me when seeing the Loaf N Jug sign was $2.32 for gas, THAT IS IT! Try $3.68 here in Maui. Missing mainland prices. I also have to report Erin that using the noodle instead of a bed guard has been working in our house. Maiyah has only fallen out 1 time and it has been almost 2 weeks. Megan, I just emailed you! Gina, SO happy to hear that! I wish I could take credit for the idea but isn’t it brilliant?! ACK! Wrong Megan. =) Megan, email me…I’m not sure which one you are. Too many Megans around here! Nah…no such thing! Ha!!! I have the exact same shoes! Great minds DO think alike!! 😉 I’m definitely going to try the Zuke muffins and Pumpkin bars…Thanks! I am a frequent reader thanks to Amy! I am another 99er! I was so happy to see your comment about car seats. I am a pediatrician and think that this is so important. My oldest is Sarah’s age and I have him in the Graco Nautilus. My youngest will be upgrading soon. My husband is thinking this is “uncool.” I keep telling him to get over it! Better to be alive and uncool!